28th December 2006 was destined to be a long and tiring day. We were all forewarned to wake up early and be prepared to sleep really late. I dont know how we managed but i think most of us were out and about by 11 (which was good considering there were only 2 bathrooms between the 10 of us, slept really late). 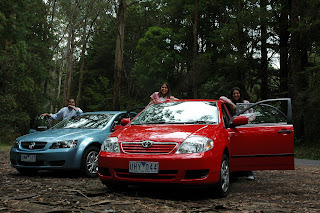 Our first stop was the Dandenong Ranges. These are beautiful mountains , kind of south east of Melbourne. We drove there in good time. Katrix and Shreyans were both in my car and I think Katrix got bugged cos i was talking to Shreyans about business and software and stuff. He probably heaved a sigh of relief when we came to our first stop, but i think he was mistaken cos there was going to be no end to serious talks when i’m in the car. Makes it easier for others to sleep as i see it. Anyway, Ridhi led us to this stop ( i think ) and we decided we might as well have a token “Trek” and decided to walk 1.6 kms to Shrebrooke Falls. 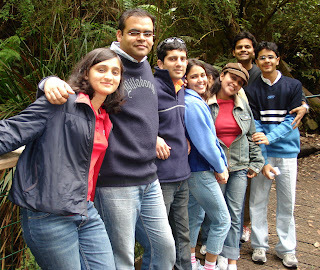 The trek was easy and fun for the guys while the girls (here i must digress and let you know that i mean all girls except Ridhi, cos although she’s a girl she almost invariably sides with the guys and takes very little bathroom time) were whinging a tad. 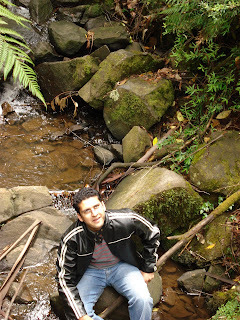 Once we reached the falls, it was unremarkable cos the falls had shrunk to a piss stream. Anyway, we got a few photo-ops. Healsville Sanctuary was apparently way out on the map, but since we were doing quite good with traffic and directions and time, decided that we should head there next. On the way, we would stop at Lilydale park for a bar-be-cue, and after Healsville, head to Philip Island. So, after a drive that seemed short, we arrived at Lilydale park and it was lovely. There was a pond and plenty of space. We found a very convenient barbie and it lit for free at the press of a button. It was clean and we mostly had to cook veggie burgers. Barbie was a first for Katrix and i think he was keen to flip some burgers. We headed straight towards Philip Island for the Pengiun Parade. It was a long drive from there and it almost took us 2 hours or more. People were really hungry by this time again. We raided a chocolate factory soon after entering Philip Island. It was run by Malaysian based Indians and there was some okie-dokie food. We were really really lucky that we can called ahead and booked (an idea proposed by me ahem ahem) for the Penguin Parade earlier in the day when we were at Lilydale. There were thousands of people at Philip Island and people who hadnt booked were being turned away. The car in which I wasnt there almost didnt make it thanks to the pesky guard who didnt understand the fact that we had a booking. He had understood it when I said the same thing earlier. So, the most fabulous part of the experience almost didnt happen. It was really cold in Melboure and hopefully we were all well dressed for the night ahead. So, this place was built like an amphitheatre but straight and facing the beach. We waited patiently for a short while and then the little penguins appeared. Slowly they all appeared from the cold sea and made their way under us to their nests and burrows. It was all quite a touching experience. We dont have pictures of this as these penguins dont like it. So then we spent sometime watching them tumble and walk in a line. They are the smallest penguins but they make up with the noise (and fearlessness). We all wished we could pick one for home. They were easy enough to steal if one was criminally inclined. After an longish interruption at the souvenir shop we headed home. It was dark and late. Katrix had vowed not to sit in the same car as me, lest he be subjected to conversation relating to business or anything remotely intellectual once we were home. We were home by 1:30 am. The other car went ahead to shop for food (Tanu has his final meal of the day between 1-2 AM every single day of his life!). I think we found the energy to play a round of Mafia or two. Slept late and slept tight. Slightly disappointed because we werent going for cricket the next day.